Knobhall Winery: A great place for the setting and ambiance alone! Charlene loves the house on the property and the relaxed vibe of the winery. It's a great place to sit down with friends, relax, and just forget about the world! Spruce Forest Artisan Village: Charlene is an absolute bird lover!!! When she discovered that one of the resident artists, Gary Yoder, was a Master Bird Sculptor, she was thrilled! His sculptures are impeccable, and he spends about four years on each piece. The village is comprised of quaint, restored cabins. Each cabin has a unique history and serves as a work space for artists, crafters, writers, etc. It is free to visit the village, and you can tour the grounds and watch the artists at work! They have a great cafe on the grounds too, The Cornucopia Cafe, where you can grab lunch and a glass of wine. The Cornucopia Cafe is tucked behind the Spruce Forest Artisan Village. It offers fresh local fare in a charming rustic setting. The view of the surrounding mountains and stream make the outdoor seating delightful! You might even catch one of the fly fishing classes at the stream! Be sure to visit the Grants Mercantile store too while you're on the grounds. It's a cute country store with a variety of gifts, home items, olive oils, and more! The Auction Square Market Place, sometimes referred to as the "Boonsboro Antique Mall, is a great indoor flea market with a wide variety of vendors. You can easily spend a few hours looking through all of the collections. Make sure you bring your truck in case you need to haul off your new antique trunk or dresser! After a long day of antiquing and hiking the Great Allegheny Passage, spend the night at the Savage River Lodge! The lodge is nestled in over 700 acres of State Forest lands making it a great getaway from city life. Charlene is a big fan of mixing high end items with affordable pieces when entertaining! With everybody looking for great deals, we are happy to see Williams-Sonoma's addition, Open Kitchen, offering a line of inexpensive kitchenware that still meets the Williams-Sonoma standard. The Open Kitchen glassware and dinnerware are cabinet essentials for the frequent hostess. The clean lines and contemporary design make it easy for you to incorporate these new items with your current dishes. If you frequently find yourself with a house full of kids after lacrosse games, art club, or movie night you will be happy to pull these out for the gang opposed to your fine dishes! They're also great for weekend get togethers with the family! The versatility is wonderful and the sleek design make these dishes ideal for mixing and matching. Don't forget about Open Kitchen glassware! It can really save you in the long run if you are constantly renting glasses for parties. You will be ready for impromptu get togethers with the girls! Open Kitchen also features bar & wine tools, cookware, and electrics. Besides entertaining, Open Kitchen supplies are perfect for a second home, a beach house, your rental property, or a college dorm! Allow Charlene's Kitchen to provide the arrangement for your next event and enjoy the full "Charlene Experience!" Email us at info@charlenes-kitchen.com for more details. All props* and flowers were provided by Charlene's Kitchen. Email us at info@charlenes-kitchen.com to discuss design & rental fees. Charlene considers this to be "the best cocoa out there!" The cocoa undergoes Dutch-processing which helps neutralize the cocoa's natural acidity. Thus, Pernigotti Cocoa has a distinct, rich flavor that will elevate any cake, brownie, or warm mug of hot chocolate. Have you ever had one of Charlene's salads? They are to die for. Charlene is a firm believer in using the highest quality ingredients in her salads, and you can taste the difference. Fini is a luscious balsamic vinegar made from sweet Italian grapes. It is thicker than your average store-bought balsamic vinegar because it is aged in multiple barrels over a 12 month period. Each barrel, whether oak or juniper, lend to Fini's complex flavor profile. Speaking of salads: what salad is complete without a drizzle of olive oil? WS House Olive Oil is an unfiltered, extra virgin olive oil made from Sonoma grapes. Charlene is adamant when it comes to olive oil, and she knows that there are different uses for every variety. This smooth, fruity EVOO is not meant for cooking. Use it in marinades, salads, or dips and taste the difference! Unlike other vanilla extracts, Nielsen-Massey's Vanilla Extract is not watered down. As soon as you open the bottle you are greeted by an intense vanilla aroma that is out of this world. This bottle's distinction comes from Madagascar Bourbon Vanilla Beans which have a mellow, smooth, and sweet flavor. Put this vanilla extract in your waffle batter on a lazy Sunday morning for an elegant treat! Artists are constantly seeking new sources of inspiration, however, sometimes revisiting the past can be just as inspiring. This week, Charlene revisited one of her favorite places for inspiration- Terrain. Terrain is a... retail experience to say the least, and it's located about 25 minutes outside of Philadelphia. Not only do they offer home decor and gardening materials, they feature artisanal bath products, fine linens, specialty dishware, an array of lifestyle books, a restaurant, and a cafe! When you first arrive at Terrain, you are greeted by a distressed brick pathway, an array of garden sheds, and beautiful white birch trees that scream, "CHARLENE!" This place is her idea of a playground to say the least. From the moment you step foot on the distressed brick path, you are transformed into a world of natural beauty. Charlene appreciates the kind of beauty the Earth has to offer, and she takes her time examining every branch, petal, and root that awaits her. As mentioned in our previous blog post, Spring is 'flowering branch season', so Charlene, an avid gardener, picked out a few of her favorite flowering branches to add to her home garden. Continuing along the path, one cannot help but notice how perfect Terrain is for Charlene's imagination. I mean, it's is an intersection of at least two of her favorite things: nature & rustic materials. From the outside, the cafe was so unassuming. It looked like it would be anywhere in Small Town, USA. These white birch poles can be found everywhere now (even at HomeGoods and TJ Maxx). Your local contractor can make this for you as a backdrop at a barn wedding or party! Charlene loves the old-world feeling of succulents and that they don't require a lot of maintenance. She loves the texture of the leaves, and the muted tones. This sap bucket would be a great vessel to hold your flatware or simply used as a centerpiece. Charlene loves dried flowers as much as fresh. This distressed wall with dried floral wreaths is a wonderful backdrop for a rustic event. Building terrariums is just one of Charlene's gardening hobbies. This would look great suspended from the ceiling with rope, ribbon, or chains for a more industrial feel. All in all, this was a great trip for Charlene & Co! We are excited to incorporate this garden theme into our Spring set-ups and our farmers market inspired Spring dishes. Check out our Menu to see our newest Spring additions! Spring is the season when Charlene begins to take full advantage of all of the wonderful local farmers markets including Dupont, Sherwood Hall Lane, and the Old Town Farmers Market on King Street. The warmer weather calls for lighter fare, and Charlene is back at the drawing boards brainstorming new menu ideas! Expect new farm-fresh salads, wholesome grains, and plenty of fresh herbs. Charlene's homemade veggie dips are a great alternative to their creamy cousins! She creates wonderful dips from beans, root vegetables, and other healthy items. Her homemade dips can be served alongside crudite, pita chips, a fresh baguette, or even spread on your sandwich! Reference the Dips section of our menu the next time you are looking for a figure-friendly option this Spring! Glasses type from left: Garnet White Wine Glass, Antique Etched Goblet, Antique Champagne Flute, Antique Sherry Glass, Garnet Goblet, Antique Cocktail (Martini) Glass, Assorted Bohemian Rocks Glasses, Red Wine Glass with Gold Spiral, and Amber Bottom White Wine Glass. Glasses from left: Garnet Goblet, Antique Champagne Flute, and Garnet White Wine Glass. The assorted Bohemian Rocks Glasses are a few of Charlene's favorites! They look great mixed in with your other dishes for an instant pop of color and texture! Don't be afraid to mix it up! Differing heights and colors make your selection of glassware much more interesting! Send us an email at info@charlenes-kitchen.com for any questions or concerns! We still need to discuss ice! With the cocktail movement in full swing, it is not surprising that artisanal ice has become a trend. Although it's often overlooked, the proper ice can drastically alter your drinking experience. 1. Freeze distilled water instead of tap water. Have you ever taken ice out of the freezer only to discover it had that "freezer taste?" That taste is caused by the impurities found in tap water. The tedious distillation process removes those impurities from water - leaving you with distinctly pure tasting ice. At $1 per gallon, distilled water can fit in any budget. Find yours at your local grocery store. 2. Ring mold it. With Spring around the corner, I can think of nothing prettier than a crystal punch bowl filled with a glorious, refreshing drink that is chilled by a floral ice ring. Creating your own floral ice ring is so simple! You will only need three things: flowers, bundt cake pan, and distilled water. Add water to bundt pan, arrange flowers, and freeze. The floral ice ring can easily be loosened by dunking the bundt pan in a shallow dish of hot water. The mold should easily slide out when turned upside down. All of the flowering branches are in season right now, so set your sights on Quince Apple Blossoms (orchids, pansies, and herbs are also great options). 3. Flavor cubes. When you're looking to add more punch to your drinks, turn to a flavored ice cube. Try using rose water for a refreshing and exotic twist or coffee for a depth of flavor. Herbs muddled with ginger and mixed with distilled water would be perfect for a Spring mojito! 4. Varying sizes & shapes. Plastic ice cube trays yielding frozen rectangles are so no longer fashionable. The cube and sphere are all the rage in today's artisanal ice rage. These cubes tend be larger in size thus producing a slower melting ice that keeps drinks colder longer. Is it just me, or are you ready for Spring? We've had enough of the snow, cold winds, and icy sidewalks, so we decided to introduce a taste of the upcoming season with our two latest cocktails: Hello Spring & Blueberry Bourbon Mintade. Besides this wretched weather, our inspiration stems from Charlene's need to revamp and recreate. "Hello Spring" is a sublime mixture of celery, lemongrass, and Buddha hand simple syrup. Muddle celery and lemongrass until fragrant. Add gin, lemon juice, Buddha hand simple syrup, ice and shake vigorously. Top with tonic water and garnish. Speaking of garnishes: no drink is complete without garnishment! 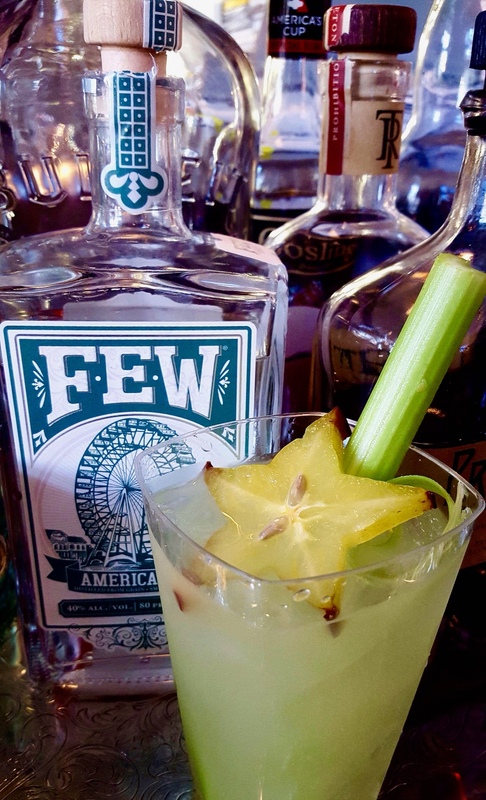 Our first glass of Hello Spring is garnished with a slice of starfruit and a celery stalk (see above). We garnished our second glass of Hello spring with a celery stalk and a sprig of parsley (see below). Although these images depict the same exact cocktail, notice how the garnish changes the drink's personality. Our other new Spring cocktail is the Blueberry Bourbon Mintade. It too was inspired by Charlene's experimental nature. It features Traverse City Whiskey, a craft whiskey Charlene discovered during a trip to Michigan, and muddled blueberries which give this drink it's rich coloring!